As Carrie Bradshaw once eloquently said, "I like my money right where I can see it: hanging in my closet." 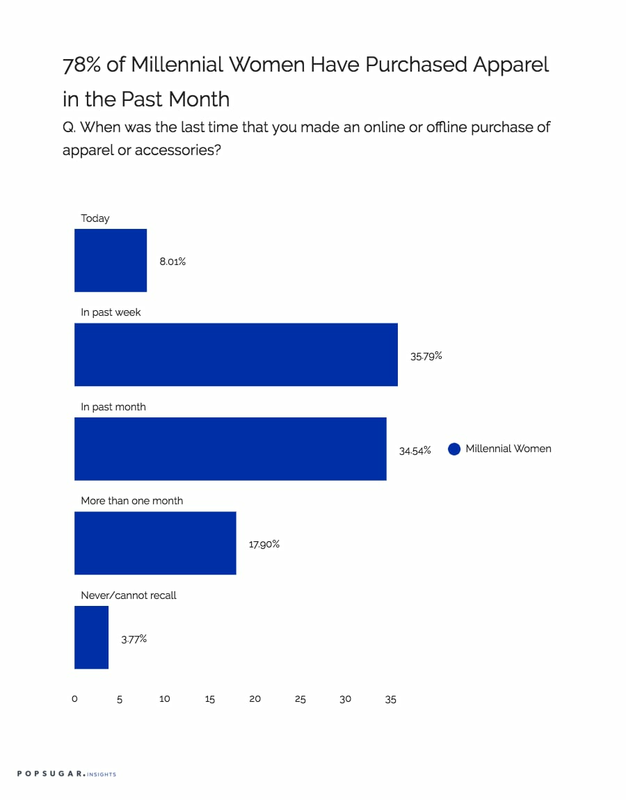 As part of the POPSUGAR Future of Retail Experiences study, we wanted to see if millennial women agreed with Carrie by exploring the when, why, where, and how women shop online and offline for apparel and accessories. We learned that shopping is a lifestyle for women, with 67% of millennial women shopping online for apparel at least a few times per month and 24% of women shopping every day or multiple days per week. In terms of offline apparel shopping behaviors, we found that 74% of women shop for apparel at least a few times per month, with over 21% shopping in a store every day or multiple days per week. In terms of apparel purchases, 43% of millennial women have made an apparel or accessory purchase in the last week, and 78% have purchased apparel or accessories in the last month. Millennials are only slightly more likely than women between the ages of 18-49 to have purchased apparel or accessories in the last month. Over 94% of millennial women spend up to $150 per month on apparel and accessories with 49% spending between $50-$150 per month and only 21% spending over $100 per month. Millennial women enjoy the ability to shop for apparel from a broad mix of store types, with 56% saying they most often purchase from mass-market stores, followed by discount stores (50%), department stores (47%), mass online retailers like Amazon.com (43%), and speciality stores (35%). 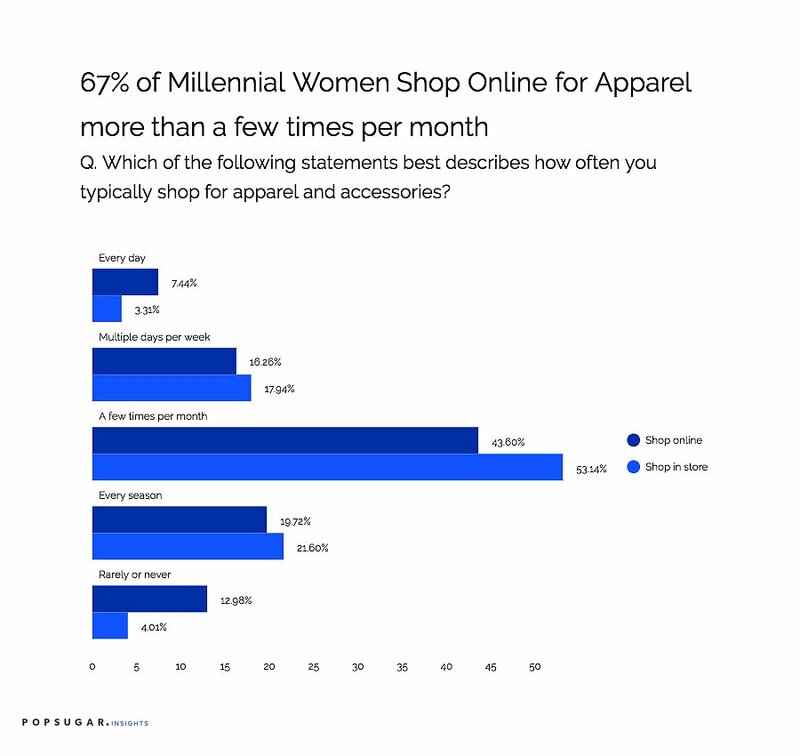 Millennial women are driven to purchase apparel and accessories from those types of stores based on price (76%), a sale or promotion (56%), the available styles (44%), product quality (39%), or brands (38%) as well as if the location offers free shipping (38%) or if the store location is convenient (36%). One-half of millennial women impulse shop, with 50% saying that when they find what they want to purchase, they purchase it right away, regardless of the channel. Nearly one-third of millennial women go online with a specific product in mind (31%), and finding the right price (67%), a sale (57%), or just falling in love with the product (56%) are the key purchase drivers for their last online or offline apparel purchase.